It turned out that the Suzuka race was a good one for intra-team polemics. Red Bull we know about, as do we know about the potential changing of the Lotus guard. 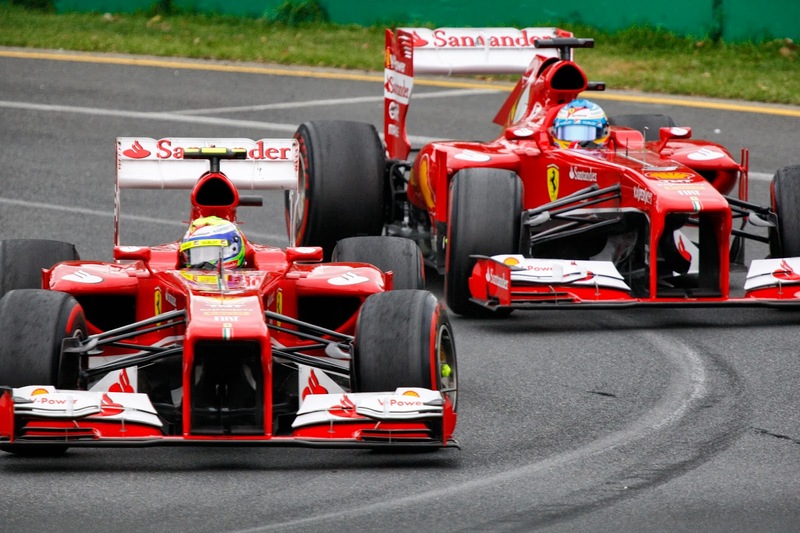 But there was one more in there as - you might say finally - Felipe Massa during Sunday's proceedings defied the Ferrari phone call to let his team mate Fernando Alonso pass him (appropriate, given 'polemic' is a word which many at Ferrari seem to have a particular fondness for). Such team orders at the Scuderia aren't new as we know, given that Alonso's almost always the faster in races (and by extension is the one who makes much stronger challenges for wins and championships) but not always the faster in qualifying. Nevertheless for all that we might say 'good on Felipe' (indeed, judging by an internet trawl, that has been most fans' reaction), it's odd that the Ferrari team is making so little of it. 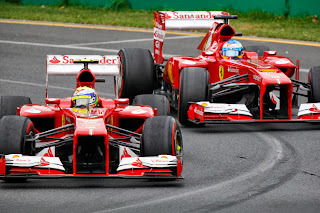 The boss Stefano Domenicali was at pains to play it all down subsequently as well as insist that Massa retains his full support; the intended beneficiary Fernando Alonso was similarly emollient. Let's not forget that for most of us nakedly defying the instructions of our boss would likely be rewarded with the sack for gross misconduct (N.B. this is said purely for illustration; I'm not advocating Massa's instant dismissal, before anyone shouts). And Ferrari isn't necessarily the first team in the paddock you'd look for leniency from. Perhaps it merely reflects the situation: Massa's leaving the team at the season's end anyway and has offered years of loyal service. In that time, while Massa has benefitted from team orders himself, particularly in 2008, for the most part he's been the one making the noble sacrifices. Given all of this it's possible that Ferrari concluded that making a fuss over it would only ensure a big rumpus for not very much benefit. Further, it didn't change the outcome: Alonso passed anyway later without pit wall assistance - something Massa confirmed - and in the end the Spaniard finished fourth which was the maximum he could have expected from that race. Maybe had Alonso not passed Nico Hulkenberg late on there would have been a bit more recrimination. But he did. Additionally, by Alonso's own admission his driver's championship chances are long gone, so all at Ferrari may be less uptight than they might have been a few months ago. All in, the context could hardly have been more benign. More broadly, this is the latest demonstration that as far as F1 fans are concerned there is no black and white sense of what is right and wrong on team orders. Instead, context is everything, and it seems that if the one defying the instruction is defined as the oppressed number two, the one man against the system - such as was Carlos Reutemann in Brazil 1981 or Mark Webber in Silverstone in 2011 as indeed Massa is now - almost everyone watching on is supportive almost every time. Whereas if it's perceived that the defying is done from a position of strength - as was the case for, um, a certain other driver that defied team orders this season - then the reaction is somewhat different.